I would like to receive occasional information and updates from Bovingdon’s Summer Scoot and jumblebee. 4th annual fun charity scoot run in memory of Rosie Speed. 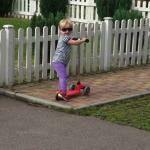 This event is a a celebration of scooting, sunshine & happy children. Rosie died from Sudden Unexplained Death in Childhood (SUDC) in December 2013. Her favourite activity was scooting around the village on her beloved pink scooter and we are very excited to raise money for SUDC research in this meaningful way. Feedback from scoots: "absolutely wonderful event", "the kids all enjoyed it and mine have been asking when the next one is! ", "so lovely seeing all these sweaty children coming in with their medals on, with such huge smiles on their faces! ", "we all had a super time", "such a nice feel of camaraderie and community today." · The scoot event follows a short, fully marshalled route so kids can either scoot with a parent wandering beside them or you can feel reassured as they scoot off independently – it’s up to you. They MUST wear a helmet to participate. · From New Hall Mews they’ll scoot to Vicarage Lane, through St Lawrence Church, round to the left, up and through Church Lane to the High Street. The roads they'll scoot on will be closed for safety. · The finishing line is at the Memorial Hall where a medal awaits them. There will be a yummy cake sale, drinks, a brilliant raffle, toys and craft activities. · Children will scoot off in small groups. Your ticket will be for an allocated 10 minute time slot. PLEASE arrive within this 10 minute time slot to ensure we spread the flow of scooting traffic. This keeps the event safe and prevents long waiting times. · Each Scoot ticket costs £5, a Raffle ticket costs £2 and you can buy tickets below. You don't need to attend to enter the raffle. We will notify all winners after the event. · You can also support SUDC UK and donate via this site in multiples of £5 regardless of whether or not you can attend the event. · There is a small 3% booking fee added by Jumblebee. All proceeds from your purchase minus minimal credit card fees will go to charity. Sudden Unexplained Death in Childhood (SUDC) occurs in children 1-18. It is a category of death when there is no explanation after a thorough investigation. To date, Bovingdon's Summer Scoot has raised over £11,000 to support this important cause. Please like & follow our Facebook page to keep up to date with events. A HUGE thank you to all our sponsors & volunteers. We are so looking forward to seeing happy kiddies enjoying a fun scoot this summer. Tickets are non-refundable, except if the event is cancelled by order of the event management. Weather - we will proceed unless the weather looks very bad & dangerous for the children & notify you by email and Facebook on the morning of the event if we need to cancel.